Find your true (puppy) love at our Valentine's Pop-Up! Meet our available dogs ❤️ with NEW SPR GEAR launching at this event ❤️ and just for the KIDDOS, an activity table to decorate a (dog) Valentine cookie for that special pup in their life by Quinn's Canine Cafe! ....applications should be submitted no later than Feb 2nd! Our pups can't wait to meet you! Join us for an interactive, fun festival for the entire family! Visit with the SPR team, throw a blanket down, listen to some tunes, and hang out for the day! We will have cider donuts and refreshments to purchase for the early visitors and a cookout in the afternoon. 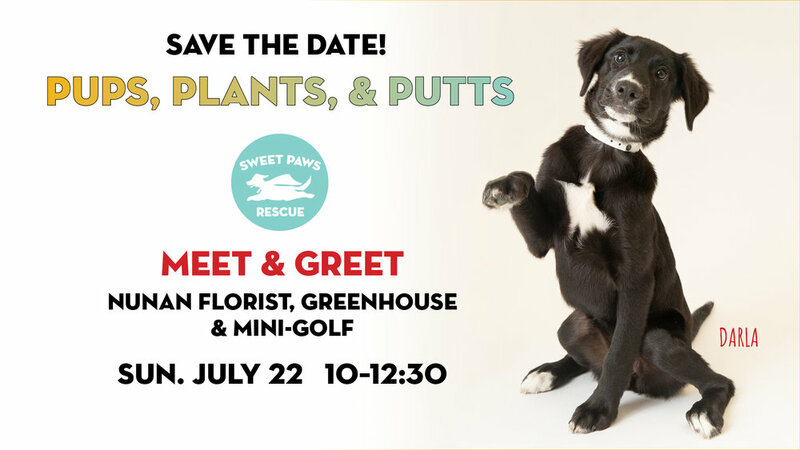 This is a chance to meet the Sweet Paws team, including our Southern rescuers from Mississippi & Alabama, the brave women who are on the front lines saving dogs every single day. This is also a great time for reunions with other SPR siblings and their mamas! All friendly dogs are welcome but must remain leashed. Hope to see you there! 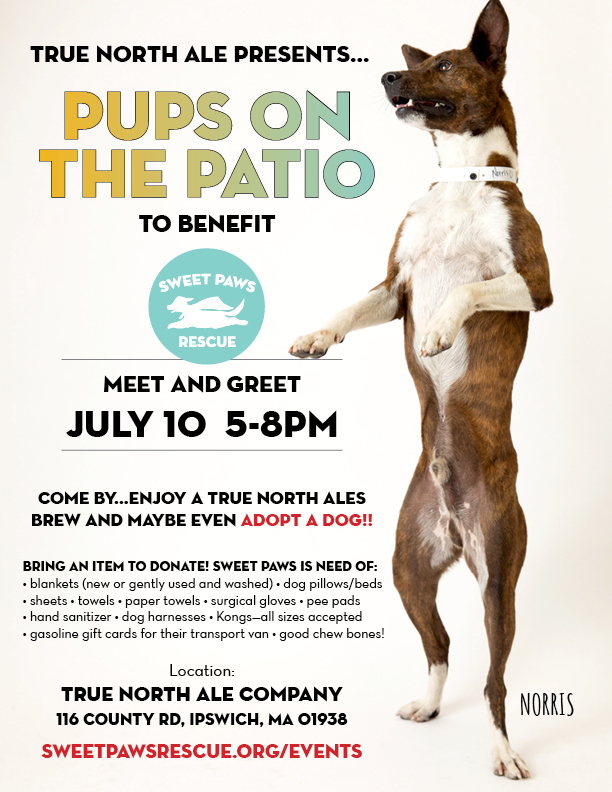 Join us for our annual and dog-friendly BARKS 'N BREWS hosted at Newburyport Brewing Co. - meet our available dogs, grab a beer, enjoy live music, and 50/50 raffle to support the rescue of our dogs! And the Brewery is graciously donating 15% of their sales during their event. We will be bringing new Fall swag too! SAVE THE DATE! 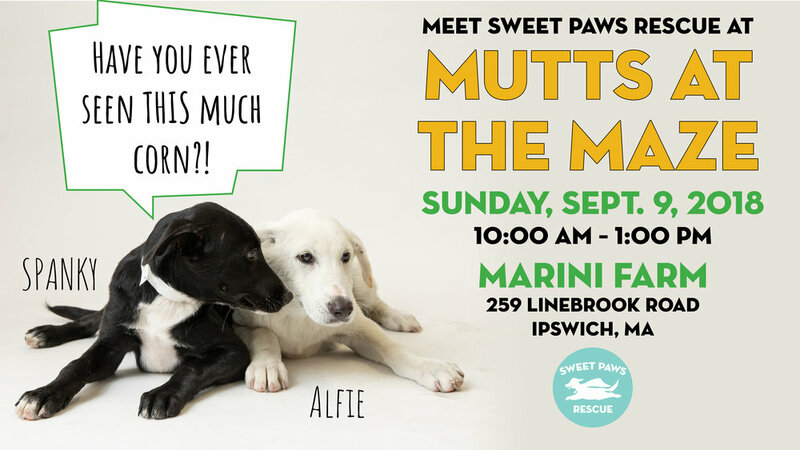 Come to Marini Farm on September 9th during Doggy Maze Days and meet some of our adoptable dogs! We'll have merch, raffles, and there will be loads of fun things to do at the farm. ...our new pups look forward to meeting you! informative tips and tools to ensure a safe transition when bringing their baby into the home and throughout childhood. Come spend the morning with us at Nunans in Georgetown for their customer appreciation weekend! We will be bringing some wonderful dogs AVAILABLE FOR ADOPTION (Get pre-approved, or submit an application that day!). We will also be showcasing our new summer merchandise and selling raffle tickets! If you would like to learn more about our rescue, including volunteering, fostering and what you can do to make a difference in our community, please come down and meet some of our team! Dogs MUST be people and dog friendly, ON A LEASH at all times. We will have water for the dogs, and if it gets too hot for the dogs they can rotate in and out of the van. We will be updating the location and time on Wednesday June 6th. This is a rain or shine event and the parade route is 2.27 miles, dress accordingly please, layers and comfortable shoes. This event gets better and better every year, we've have a great turnout and so much fun from setting up the van to handing things out along the parade route, walking with the dogs, dancing to the music. You can't help but pick up on the amazing joy and love from everyone there. This is an experience you will always remember and want to do every year!